Finally, my site! Thanks to all my friends who’ve encouraged me and waited patiently. Why “Holly on the Lake”? Because it’s easier to remember than recalling that my name is spelled with the Danish “sen”! And because I want to share my simple world on this little lake and so many others I have loved. I live lightly on the earth and close to the land, using recycled and found goods almost exclusively in all areas of my life. 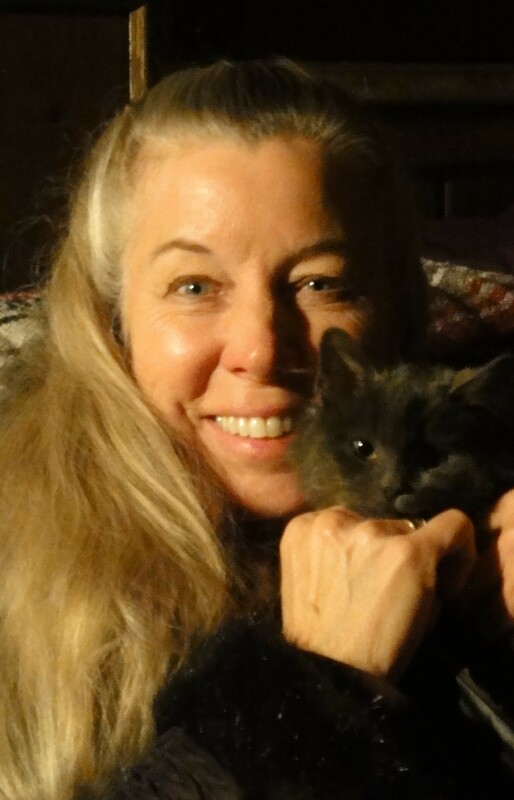 I find an abundance of creative joy, financial freedom, and spiritual peace in this lifestyle and love to share it through my speaking and writing. I appreciate those who’ve been asking about my book, Free, Green, and Frugally Rich – Scenes From a Joyful Life. It is coming! But it’ll take a bit longer, while I care for my sweet mother. It’s hard to put my work on hold, but then, the core of the book is about knowing what’s most important and living accordingly. So here we are. While I struggle with the many mysteries of the brain and spirit, I trust that I will learn something from the journey that will enrich my writing. In the meantime, I’ll share original stories, music, photos, (taken by me unless otherwise noted) and bits of my book. (Okay, if you insist, I’ll throw in that video of my cat Lucky and her mouse friend!) I’ll let you know when I’ll be speaking, and share some tips on Saving Money, the Planet, and Your Sanity. 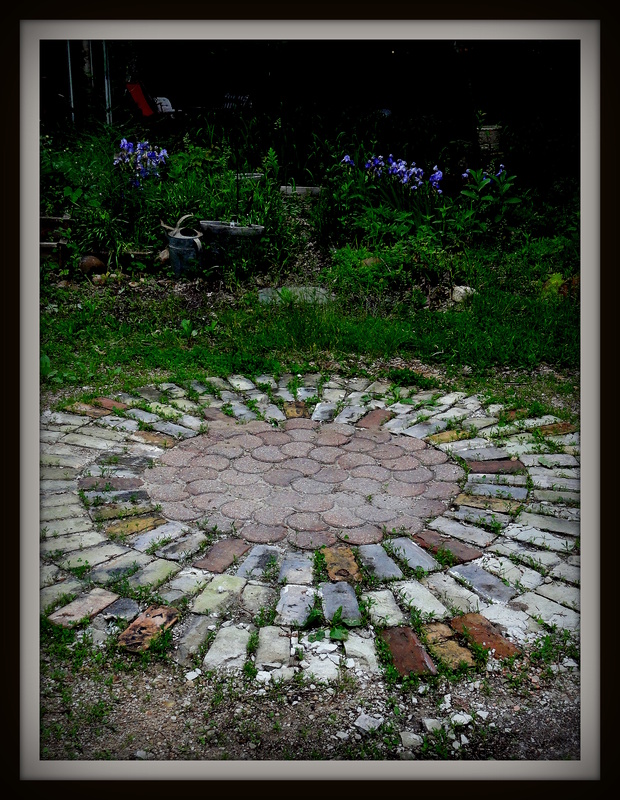 It’ll be fun to post pictures of some cool junking finds and creations, like this “brick chrysanthemum” I made from pavers found here and there. It was free, fun to make, and solved the puddle problem in my driveway. Mama raccoon taking a break from her six kits sleeping inside the tree. My motivation to write is most often to share the surprises and mysteries around me. 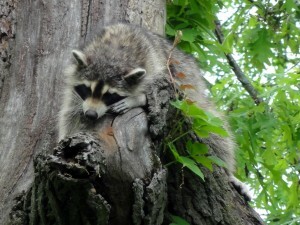 The last two springs, I was delighted by the daily drama of a mama raccoon outside my picture window with her adorable chirping kits. Five the first year, then six. Will she be back this spring? I’ll let you know! Thank you for joining me in the world I love. LOVE your new website!! How exciting!!! Makes me want to check back to see what you have updated. WELL DONE!! Thank you, Sue! I still have so much to do, but I have a bit of momentum now. Do let me know if you see errors, okay? I read your article in “Our Life” paper in last Thursday’s Sun newspaper. Loved the article. I was at your place a few years ago with the Apple Valley Senior center tour. I loved seeing what you have accomplished. I got to know your mom and she is a lovely person. I praise you for caring for her and her needs. I saw you just recently at the senior center with your mom. Hope she is happy. Just wanted to let you know I admire you. Thanks. Thank you, Margaret, for all your kind words. I’ll tell Mom I heard from you. Our best wishes to you.